This GE alarm starter kit is great for residential or commercial use and includes the Concord 4 alarm system in a locking metal enclosure, and an LCD keypad and phone jack. Out of the box it supports 8 hardwired zones and 96 wireless zones. The built in wireless receiver supports any GE SAW or crystal wireless products including door/window sensors, motion sensors, smoke detectors and keyfobs. The system can be expanded up to a total of 96 zones. 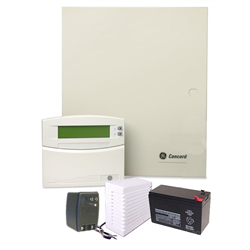 Build your system by adding any of our wired door/window contacts, water sensors, motion detectors, 2 or 4 wire smoke detectors and any GE wireless key fobs or GE wireless door/window or GE wireless smoke detectors. Does not include siren, battery, AC adpater unless you add the ALARM-HWKIT.